I had this incredible experience the other day! I took a tea and sat in the gazebo at the back of our property. I noticed a dragonfly on the inside of the screen and wanted to assist its return to the outside. I lifted the screen and gingerly scooped my hand around it. As I was about to release it, it didn’t want to go. It held on to my hand tightly and slowly walked to the end of my finger; in no hurry to go. I noticed and thought it was cool that it was not afraid of me. I bent over and edged it onto the grass, with its reluctance. It just sat there, perhaps looking up at me. I felt it wanted to be picked up again, so placing my finger down to it, it climbed aboard. 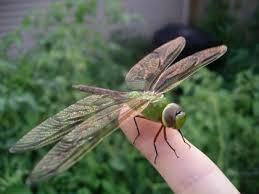 The dragonfly sat on my finger with its head moving all around. Was I observing it or was it observing me? Its front feet touched my skin and washed its head. I was in awe by the details of this beautiful creature; its intricate movements, as well as the bonding moment we were having. I felt as if it was communicating with me on a soul level, in a language beyond words and sound. I couldn’t help but be so engrossed in the moment of connecting with such an incredible creation. I was mesmerized! Eventually, I said “Ok, I have to go now” and placed my hand to the grass and it gently flew up and landed two inches from my hand, again sitting there as an observer. I believe part of our life’s journey is to find and maintain a balance between doing and being. We are human beings after all. Too often, in summer especially, we are torn between going here, going there, doing this, or doing that. We mostly feel scattered and easily stressed with everyday life. It is all too easy to wake up in the morning, turn on the coffee pot or kettle, then walk to the computer, immediately jumping into what is going on with everyone one else in the world. What if we changed it up? What if we checked in to what is going on with us and the world of nature around us? What if we sat in a special place, went outside, walked around, breathed and observed the world of nature and wonder right in our own backyard or a nearby park? What if we took the time to be still and be the observer, using the precious gifts of the five senses we were given? Even if it was for five, ten or maybe thirty minutes, our day and lives would change! The sense of peace and calm that is naturally experienced will affect our overall well-being in incredible ways. Practicing this regularly will help us maintain balance in doing and being the shining souls that we are!